Here we are at the start of a fresh new week. We are journaling our journey with Jesus and this is a check in point along the path. How goes your journey? Let’s sit for a moment, take a break and check in. I think the biggest misconception believers have is that our Christian lives should be devoid of difficulties. You scoff? Well, tell me about your responses to the latest challenges, difficulties and attacks on your peaceful, ideal existence. Be honest. No BS. I am fully convinced even mature Christians struggle with where to file bizarre, unexplainable events, misunderstandings and circumstances in their lives. Don’t think I am above this, my friends. I recognize I am not. Hence why I write about it! This past week I began my morning quiet times, however brief, long OR distracted (more on this later) in Titus, as you may already know. But, I was quickly redirected by the Lord to Romans. I had read through Romans the last week in March but, a scripture reference sent me scurrying back and it seemed God wanted me to linger in the last chapters, specifically 12-16, for the rest of the week. Make no mistake, my God whispered word for this year is Redeemed with a scripture focus of Romans 12:1-2, so spending time in this particular book is a priority. I do have multiple commentaries and additional writings on it, but prefer to keep them outside of this quiet time for the most part (not always!). Let me add, there are no “rules” for my quiet time/journal time but only the one desire- that I connect with Jesus (I am sure at a glance this looks bizarre) AND to hear God speak into the particulars of my own little life. 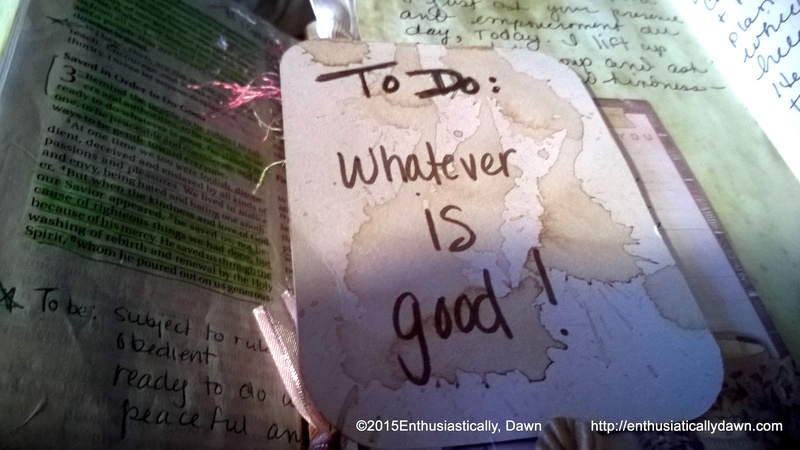 As far as the details of my journaling, honestly anything goes. I intersperse conversation with written words. Sometimes if I am passionate I say the words as I am writing them. This is why, my journals are a bit messy…my mouth moves pretty fast. BUT, the writing causes me to slow down. This past week, I was able to move quiet time outside to the (still messy) patio a few days. Being outside is a blessing in that I take in the trees, birds, air. Being outside allows me to feel as though I breathe in God’s very breath. I find it inspiring. It helps me focus AND distracts me at the same time. But for some of you who find yourselves distracted during your attempts to journal, pray and read God’s Word, (I have a post coming this week for you) I want to suggest perhaps distraction is just a different way of drawing you closer to the Lord. Yes, I mean it. You can be “distracted” by God. What is so bad about being distracted from self to the things of the Lord? That is the whole of our faith! To be so caught up in Him, that we are distracted by His presence, gifts, creation – caught up in His love, grace and mercy to His glory. That is distraction that is not negative. I do not think God made a mistake in the way he deigned how I process and think, or the way I am. I believe the way He created me and the way I think are gifts to be surrendered to Him, and used for His glory. I am ever being Redirected by Him by His grace, for His glory, as is His will. It is not impossible to take your distracted mind and redirect it to Him. I think this is one way God keeps me reliant on Him. My mind may wander, but I have a Good Shepherd who empowers me to take every thought captive to Him. My ADHD mind, leads me closer to Him, as I allow Him to direct me, ever so graciously (again and again) back to His care, back to the still waters and green pasture of His truth, back to the safety of the flock. So this is what I do, I take my journal and Bible and sit. I wait, for direction and see where my mind goes. Then I open the Word and ask Him to speak to me. I usually read a book through, but not all in one sitting. I have to be very careful NOT to crowd my quiet time with additional readings, because this usually leads me away from getting enough scripture. I read additional Scripture helps, studies, Christian writings, BUT not during my QT. For days I am really unfocused, however, I keep an Our Daily Bread devotional booklet in my QT Basket to get me started. An overview of my reading/mediation/focus last week: Titus; Romans 16-12 (yes in reverse); Psalm 100 & 34. My strongest impressions coming from Titus and the To Do List set forth To Be: subject to rulers, obedient, ready to do whatever is good, peaceful and considerat, gentle toward everyone always. Additionally the To Teach List (Titus 2:11-15). Romans redirected me to the attitude and mind of Christ IN ME, instructed me to be clothed in Him and also reminded me NOT to be overcome by evil, but to instead overcome evil with good. I need these reminders, friends. Daily. My default setting is being transformed from self to Christ. But it is a process. One that requires my submission: His will for mine. That comes by sitting in the Word which is able to transform a sinner to a saint! I did write a poem during my QT Tuesday,as I meditated on the scriptures above, which I will share this week. Also one day, I stared at the birds, lost track of time and did not journal at all, but prayed aloud…and for those of you who still feel like nothing is happening in your QT yet, I want you to know that there are times I get busy and realize that I did not connect with the Lord at all! Usually, it’s when I am overwhelmed with all I WANT to do, be, say etc. Those days, I am grateful -even more- for GRACE. Sometimes I just need to pray the Annie Lamott prayer…Help, Thanks, Wow and trust that He really is in control, and our only business is to recognize Him with these most basic acknowledgements. There is more…but I will save that for another day. As for the week ahead? Let God Redirect you from yourself for His glory. I am planning be hanging out in the Book of Colossians for the start of my week. Unless I am Redirected! OH- let me know how you are doing and how I can help you on your journey. Or share your most poignant points from your time with the Lord the past week- in the comments below. Oh my, how do I begin!?! One huge item is that I’ be blessed with very quiet life, especially externally. Internally–oh boy, it’s usually noisy party,until I take a deep breath, and let it out slowly. Only then, do I feel truly to receive what our Lord has in store for me, in my quiet-time. What I’m doing is following, week-by-week, the “Women of Faith” Study Bible; I’m in week 20: ‘Intimacy with God’ , the focus is on Song of Songs 2:1-14. It is lovely passage! In the afternoons, before I start working on my novel, I read from Titus. On a different topic (but not far), has any one been watching “A.D. the Bible Continues. . .”? It’s really exciting to see the drama of the New Testament unfold! In the USA, it’s on NBC, 8pm Mountain time.